When Andrea Gross was diagnosed with multiple sclerosis in 1980, she felt adrift — no one knew how she was feeling, what she was going through or what lay ahead. Over the years, her health and functionality deteriorated, and she became increasingly isolated. 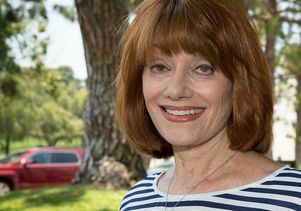 That isolation finally ended 21 years later when she found a program founded by the UCLA Department of Neurology and the National Multiple Sclerosis Society that gave her life a new direction. The Marilyn Hilton Multiple Sclerosis Achievement Center at UCLA, which celebrated its 15th anniversary on June 21, became her refuge. Every Tuesday, she participates in the REACH to Achieve Program, which offers therapeutic leisure activities, exercise classes, art therapy, cognition improvement strategies, and health and nutrition education to help MS patients better cope with their disease and its symptoms. Once the only day center for MS patients from UCLA and other institutions on the West Coast, it has become a national model and has been replicated in other areas in California and by other states. The program keeps members more physically fit and decreases isolation, a common problem for those with MS, said Elise Herlihy, the center’s executive director since its inception in 2001. About 15 to 20 people with MS visit the center, located in the Rehabilitation Building on Veteran Avenue, on any given day, Herlihy said. On a recent visit, people taking an adaptive Tai Chi class did controlled movements from chairs or wheelchairs. Downstairs, an exercise specialist was helping others stretch and use specially designed machines that help with balance and limb strength. 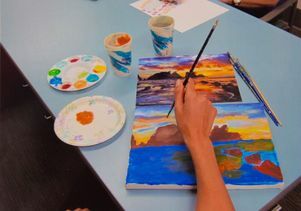 Walls in the art therapy room displayed members' colorful artworks. Two relaxation rooms provided those dealing with fatigue a place to rest or nap. Living Well with MS for the newly diagnosed provides information, strategies and tools to optimize participants’ well-being. CogniFitness is an interactive program that provides strategies and tools for dealing with common memory and cognitive challenges that can accompany MS.
Free From Falls is a fall prevention program designed specifically for members with MS who are able to walk, but may be at risk for falling. Free From Falls II is geared to members who use a walker. LEAP — Lifestyle Education and Assessment Program — provides a comprehensive, one-time evaluation of neurologic and functional status. The Multiple Sclerosis Achievement Center is funded primarily by the Conrad N. Hilton Foundation, which has contributed nearly $7 million to date. Marilyn Hilton lived with progressive MS for years and visited the center more than once, Herlihy said. Over the last 15 years, members — most on fixed incomes — have raised $755,000 to support the center. Dr. John Mazziotta, vice chancellor of UCLA Health Sciences and chief executive officer of UCLA Health, said he is impressed with the collaboration that occurs daily to provide the wide variety of services for members. “This was a revolutionary vision, and this center is a showcase and model for the world,” he said. The center staff includes recreation, physical, occupational, music and art therapists; a clinical exercise specialist; a dietician; speech and language pathologists; a recreation instructor; and two adaptive Iyengar yoga teachers. Elizabeth Cheung, senior program manager for the Hilton foundation, said that over the years, more than $35 million in grants for MS services and research has been raised and distributed. “I think this center is something Marilyn would have really loved,” Cheung said.